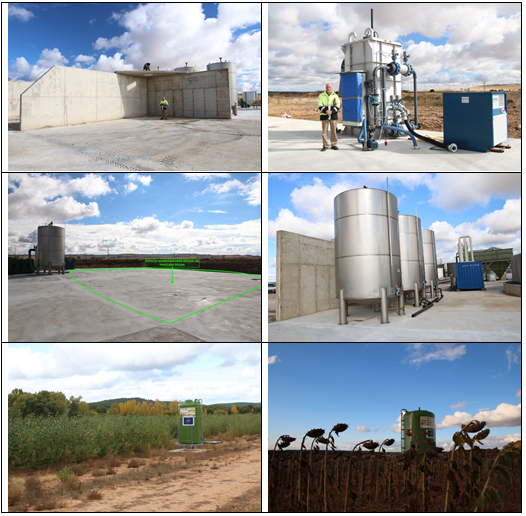 On the 14th of October, the technical coordinators Luis Leyda of Teqbio and Arturo Daudén of COPISO, accompanied by the technicians of PURAL met at PURAL facilities in ALMAZAN, in order to see the progress on the installation of the pipes. During the visit to the purifier, a review of the status of the treatment phase as made to obtain the liquid fraction used in the crops field trials. Pipe communication with the area between the phase separation zone and the area of anaerobic digestion: built. Pending the installation of the centrifuge and phase subsequent separation, prior to final filtration. Bosman filter installed, pending the connection with the previous phase. Area for accommodating the drying stage of DORSET is built. The completion of the installation of the remaining equipment is expected during November. The use of the liquid phase according to the new configuration of the crop cycles is expected in February 2017. Visit to the True test #1. With the sunflower crop, prior for the cultivation of barley which already are using the liquid phase of digestate as fertilizer, and #4 evolution of poplar cultivation. Prior to test with a liquid phase.